When Julie (my wife) and I were children growing up in Florida, both our grandparents were fern growers. The only product grown at the time was plumosus. The industry was a family business. Plumosus was grown under oak hammocks, wooden slat houses, and the family orange trees. Julie always enjoyed tagging along with her mother as she cut under the orange trees, especially when the fruit was ripe, as Julie would climb a tree and eat until she could hold no more. A sign would be posted in the window of the packing house each day to let the ice man know how many pounds of ice to leave as the plumosus was shipped by non refrigerated train. The ice was chipped in each box to keep it as cold as possible. The fern was packed in wooden boxes and loaded on a flat bed truck for the four mile trip to the old train depot. From there it was shipped to markets on the East Coast of the United States. Now our products are shipped by refrigerated trucks all over the United States and Canada, by air and sea to foreign countries. 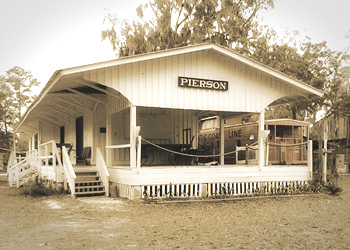 The varieties of greens we grow today are numerous, and the old train depot has been moved five miles to Barberville where it is on display at a pioneer art museum (pictured above). Two of the best changes occurring over the years in our industry are; when cardboard boxes replaced the wooden crates our grandparents had to use, and when representatives from Hydroseal asked our company to begin testing their product. Upon testing with Dr. George Staby from Chain of Life Network, WE SAW SUCH A DRAMATIC IMPROVEMENT IN THE APPEARANCE AND LASTING QUALITIES OF OUR FOLIAGES that we began to develop a process for treating them on a large scale. Yes, we've seen a lot of changes in our industry and we know there will be many more to come. In an effort to meet the needs of a global market we have found, it is not just what you do but how well you do it.